The internet has been passing around this photo of Ryan Howard for several days, or at least since it was discovered after being tweeted by a fan who snapped it at a suburban Philly Whole Foods. It is at once sadly and hilariously emblematic of the sudden conclusion to the Phillies' season. Now, there have been some doubts about when the photo was taken. Initial reports said Tuesday, but after Howard was spied on crutches at that same Whole Foods that same day, subsequent reports revealed it to have been shot Saturday, the day after Howard tore his Achilles and made the final out of the Phillies' season in Game 5 of the NLDS. Other sites have hedged regarding its accuracy, but Dan Gross, a gossip columnist at the Philadelphia Daily News, confirmed to us via email that he has an independent source who said it indeed was Howard at the Whole Foods in a scooter on Saturday. So that settles that. 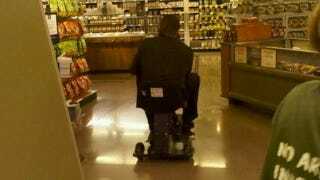 But let's put aside the obvious question of why a ballplayer with a $125 million contract and an injury that threatens to keep him out well into next season is reduced to wheeling/hobbling himself to the grocery store twice in a matter of four days. Let's get to what we really want: Your photoshops. We've done this before with Larry Merchant, That Guy and Tiger Woods, Jim Tressel Signing Things, Cigar Guy, and Jason Whitlock. It only makes sense to add Big Piece shopping for food on a scooter to the pile. Place your entries in the comments for all to see, or feel free to email them to me at dom[at]deadspin[dot]com. Best one wins a prize. Look for all of 'em to appear in a totally stupid post out of which we can all get a quick laugh sometime next week.